Do you know anyone who is indifferent on the subject of cranberry sauce? I don't. Really, people seem to either love it or hate it. There are even people who adore that stuff that comes in a can, slithering and wobbling onto the Thanksgiving table. Though if you ask me, it should have a name unto itself, one that doesn't malign by association the noble cranberry and its resulting sauce. I spent the first four decades of my life solidly in the "hate it" camp, but somehow in middle-age I was mysteriously transformed into a lover, nay, a connoisseur, of cranberry concoctions. And as a cranberry condiment lover, each year at the holidays I make a sauce that is, if I do say so myself, nonpareil. Sweet and tart, with depth and complexity, this is a truly remarkable version of an age-old standby. Because I am generous by nature and a cranberry proselytizer to boot, I'm going to share my recipe with you. And even if you aren't a fan, you may want to keep reading, because at the end of this post I'm going to teach you how to do something magically delicious with leftover cranberry sauce. Put the liquids in a saucepan over medium heat and dissolve the sugar. Stir in cranberries and cook until they begin to pop. This is fun, as the satisfying popping sound never fails to amuse. The entire process takes all of about 10 minutes. Let the whole mess cool and refrigerate until time to serve. If you're feeling frisky and want to throw all caution to the wind, toss in a handful of pomegranate seeds and mix it all up. This is an awesome recipe. It results in truly mind-boggling cranberry sauce. And yet, you will likely have some left over, due to overall lack of cranberry enthusiasm on the part of many of your dinner guests. Do not despair. Here is something you can do to melt the heart and tickle the tummy of even the most hardened cranberry hater. 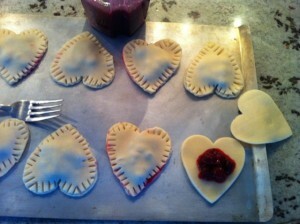 Put a tiny dollop of cranberry on half the hearts. Don't overfill the hearts or you will have oozing issues. Top with the remaining hearts. Crimp edges together with fork tines. Say nanny nanny boo boo to all the haters who are scarfing down your heart tarts. P.S. You may want to put this on file for Valentines Day.